13 properties were found to match your criteria. For full details please click the accommodation titles or images. When searching by availability dates, please note we will only filter out properties we know to be occupied. Properties that we don't have availability information for will still show but may be occupied in the period you are searching. This delightful three bedroom is situated in a very convenient location just 20 minutes walk from the old town of Pollensa and less than 10 minutes drive to the beach resort of Puerto Pollensa. This private and spacious property with a large freeform swimming pool which includes an integral solar heated Jacuzzi is set in beautifully mature gardens in tranquil countryside just four kilometres from the popular family resort of Puerto Pollensa. 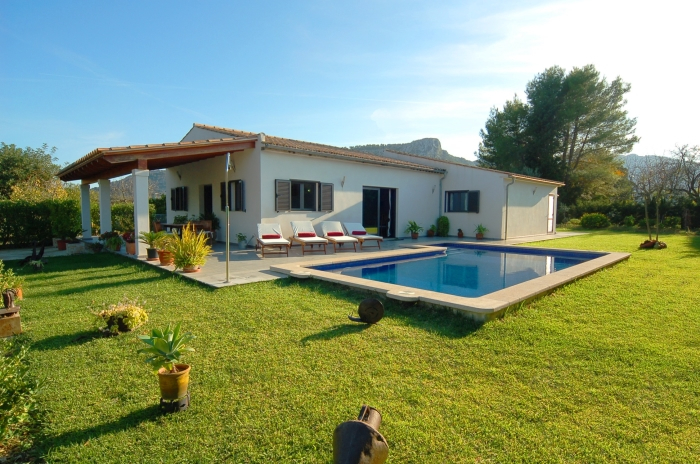 Villa Estades Petit is a smart and comfortable family villa located in lovely countryside set back off the road to the resort of Cala San Vicente in a quiet country lane just five minutes drive from Pollensa and Port Pollensa.